If I tell you there is dry mustard in this cake, will you believe me? I hope so, because it's 100 percent true. I know! Dry mustard in a cake - who would have thought? But it's one of the reasons I wanted to try this cake out. Well, that and the beer. Beer in cake too? This is crazy talk. 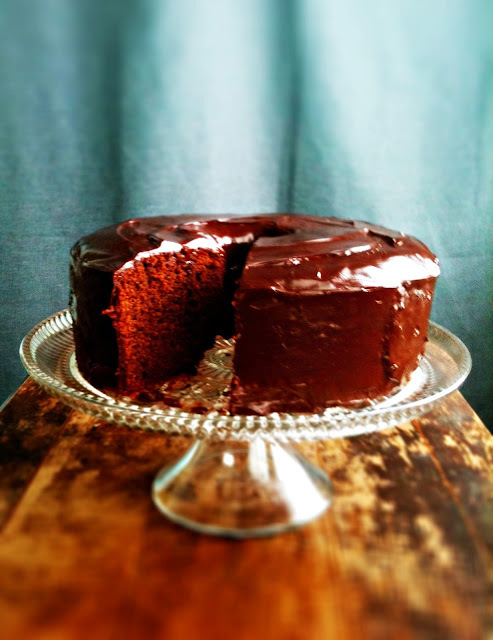 I've put beer in bread and in barbecue sauce and down the gullet, but never in chocolate cake. But 'tis the season of St. Patrick, so why not? When you've been baking cakes as long as I have, it's cool to shake things up and see what the heck will happen. I can tell you this cake started out by giving me grief, but there was a happy ending. And that's all that matters, right? 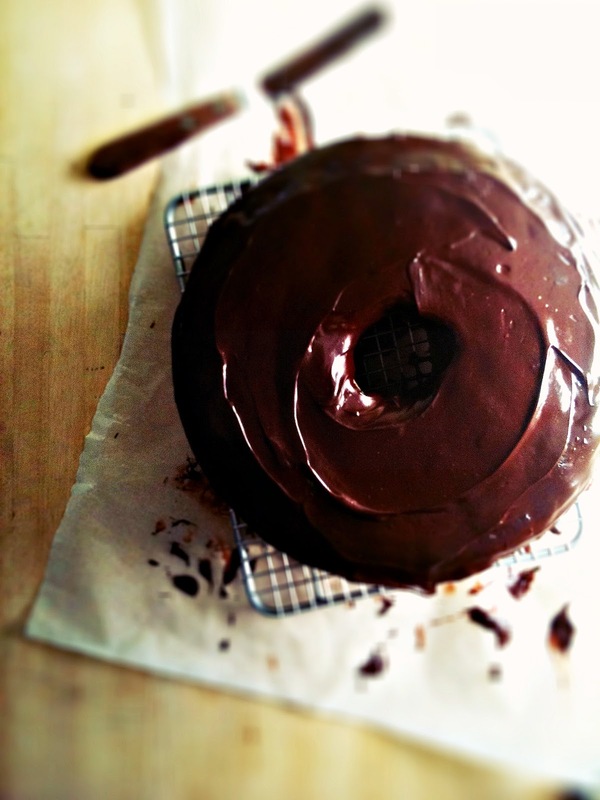 The grief bit: so I had this dark, non-stick bundt pan that wasn't performing well. The previous rosemary olive oil bundt turned out beautifully on top, but was quite, um, dark brown on the bottom, but I hid that bit from you. I thought if I reduced the heat and shortened the bake time, this time around, I'd be in the clear. I love the look of a bundt pan and wanted to use that instead of my tube pan ... and that's when things went wrong. I took the cake out at 45 minutes and the top was already too dark. In my haste, I tried to remove the cake after only 15 minutes of cooling, as I was afraid it would get too burnt on the bottom if I kept it in that damn pan. I totally should have known better. So I inverted the cake and shook it gently but nothing happened, then I gave the pan one good shake and it was all over. You know that feeling when you look at a cake pan and half the cake is still in it? Yeah, that. Didn't know if I should scream or cry or swear, so I opted for the latter, as I'm rather good at it. And then I let out a deep breath. It's only cake. We can re-group! But let it be said that that cursed bundt pan found its way into the garbage. Burn me once, twice, but never three times. Take that, bundt pan! Saturday afternoon had now turned to Saturday night and I was left with a broken cake but determination to try again. Just as I was planning on giving it another shot, with the aluminum tube pan this time, I realized I had no eggs. Or cocoa. Too lazy to leave the house I decided to just get up early Sunday morning and bake the cake again before I was to meet a friend for brunch. This is quite hilarious in itself because I love sleep. Especially weekend sleep. But there I was, Sunday morning at 7:30 am, driving to the nearest Shopper's Drug Mart (thankfully open 24 hours), for a dozen eggs and a can of cocoa. I had managed to brush my hair, but not my teeth and had thrown my parka over my pajamas. It's a hot look, you should try it sometime. My failed attempt was actually a blessing in disguise (aren't they all?) and after nibbling on the bits that came out of the pan, I was able to tweak the recipe a bit, adding a bit more of this and that. The batter is pretty simple to prepare, just be sure to sift your dry ingredients together so you don't get a lump of dry mustard in the batter. Any dark beer will do. I asked the nice man at the liquor store and he directed me to the import section and I picked up an Old Engine Oil Porter from Scotland. 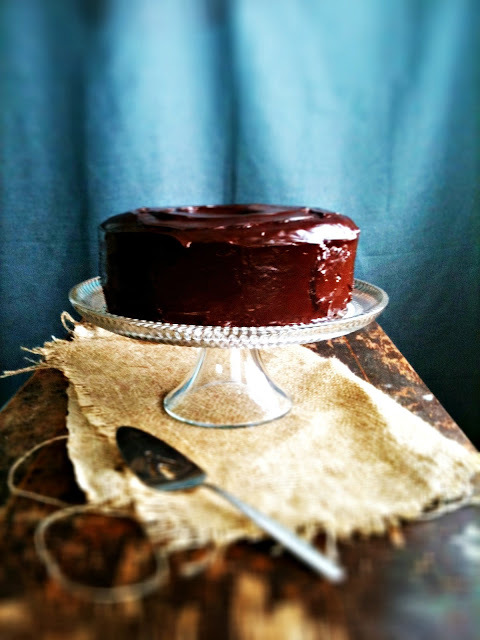 Described as viscous, bittersweet and dark, with notes of chocolate, I knew it would be perfect for cake-baking. Any dark porter or ale will do, really. And just think, you only need 3/4 cup so the rest is yours to savour while the cake is baking. Oh man. I should warn you about the smell that will come out of your kitchen. Spicy, chocolaty, gingery, it's all good. And I should note that the cake baked to utter perfection in my light aluminum tube pan. Popped out like a dream. You can't really detect the mustard or beer on their own, but they build up to something beautiful. 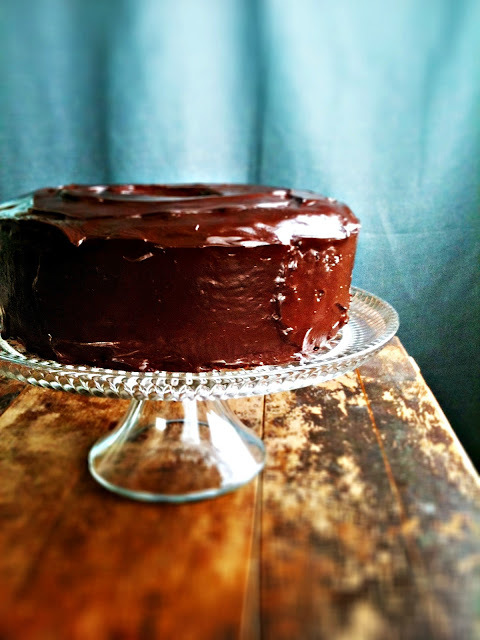 The flavour of this cake is complex and full of all kinds of nuances. It's unusual and delicious and far from boring, which I rather like. 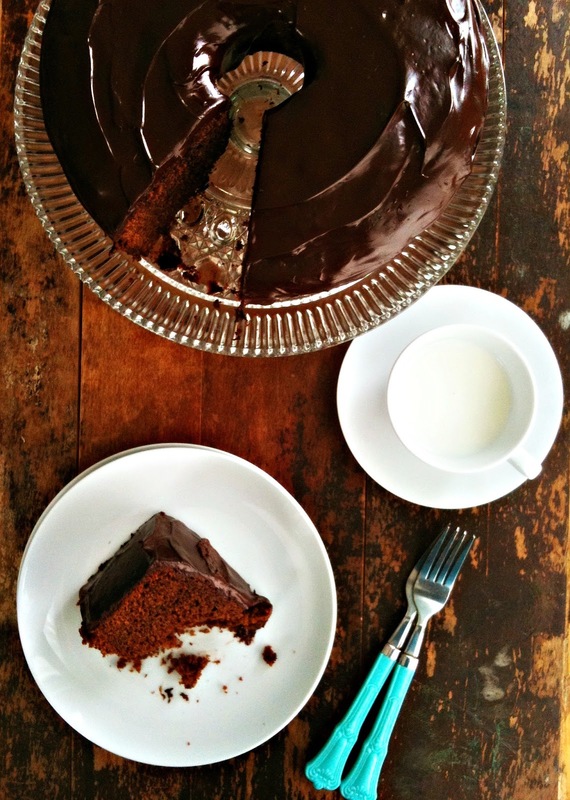 The crumb is tender and moist, just like a chocolate cake should be, but the ginger is at the forefront too, not willing to be forgotten under the rich chocolate glaze. Speaking of glaze, this is where you can play around - let it drizzle down, or let it firm up a bit and coat the cake entirely in rustic sweeps with your spatula. It's going to get a bit messy, but that's okay. It's only chocolate. Was this cake worth the sacrifice of a Sunday sleep-in? Yes. Have I learned the importance of a well-stocked pantry and fridge? Sure have. Am I on the quest of a new bundt pan? Absolutely. This one has my name all over it. Do I make a habit of leaving my house pajama-clad? Only if baked goods are at stake. Grease and flour a large tube or bundt pan -10-12 cup capacity. Preheat oven to 350 *F.
In the bowl of your mixer, beat together the oil, brown sugar, molasses eggs and salt. Beat until light, scraping down sides once or twice. In a large bowl, SIFT together all dry ingredients (flour-baking soda). Don't ignore this step! Melt the 2 ounces of chocolate and 1 tbsp butter on low, stirring until smooth. Set aside. Add half the sifted ingredients to the wet, beating on low for 30 seconds. Beat in the beer just until incorporated. Add the remaining dry ingredients, beating on low for 30 seconds, then stir in the buttermilk, beating on low until smooth. Stir in the melted chocolate. Stir until smooth. Pour batter into your prepared pan and bake in centre of oven for 50-60 minutes, checking with a skewer to see if it's done. Cool in pan for 20-30 minutes, then remove. Let cool completely before glazing. 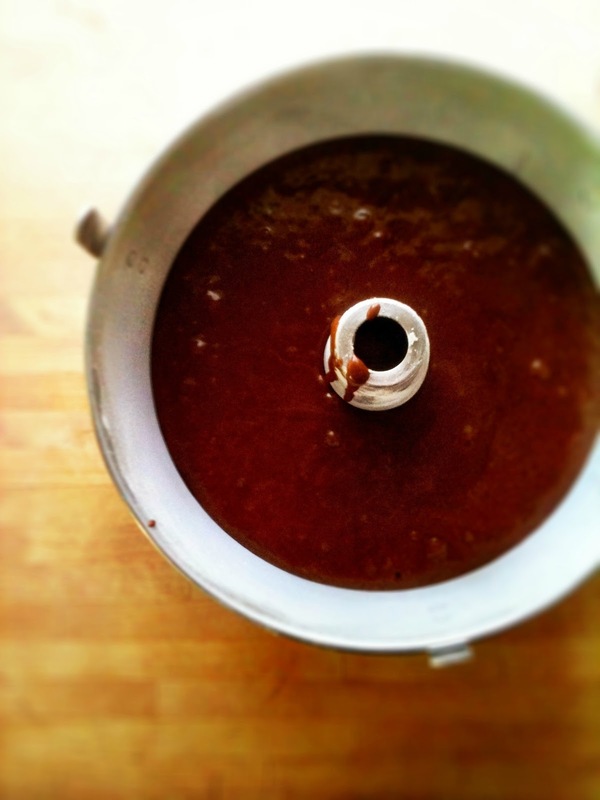 To make glaze, melt together the 6 ounces of chocolate and half and half. Whisk until smooth, and til desired thickness. I wanted mine a bit runny, so I added more cream. Pour glaze over cake. You can leave as 'drizzles' or you can smooth out and glaze the cake entirely. The choice is yours. Allow glaze to set 15 minutes before slicing. Keep covered at room temp, but eat within a day or two. Serves 10. Adapted from Food 52. Sounds amazing! Stunning photos again, Renee. Love all the spices in this cake! I made a Guinness cake last year for the first time and was so surprised at how moist it was. I was thinking I should put a bit of beer in all my chocolate cakes. Gorgeous cake; it has all my favorite flavors. Did you know that pajamas are the perfect "underwear" when you're watching an outdoor hockey game? Renee this sounds sinfully delicious!!! Also, I'm really liking the choice for the new Bundt pan....very pretty. 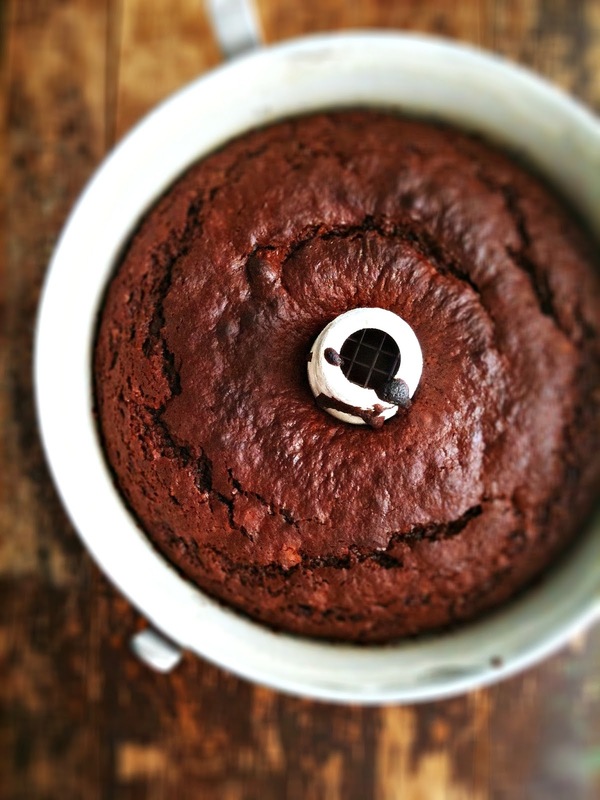 Bsy busy this weekend so no cake baking for me but soon...very soon, this will be on the menu! Love your determination to get it right. The cake is gorgeous as is your blog. I can't tell you how many times I have been "gun ho" to bake and find I don't have all of the ingredients. In most cases this may be a good thing as sweets in the house are not welcome on my thighs, but I can see being prepared for this cake. Kate - thank you so much! Candus - it's a beauty, isn't it?! Penny - thank you so much! Glad you stopped by.